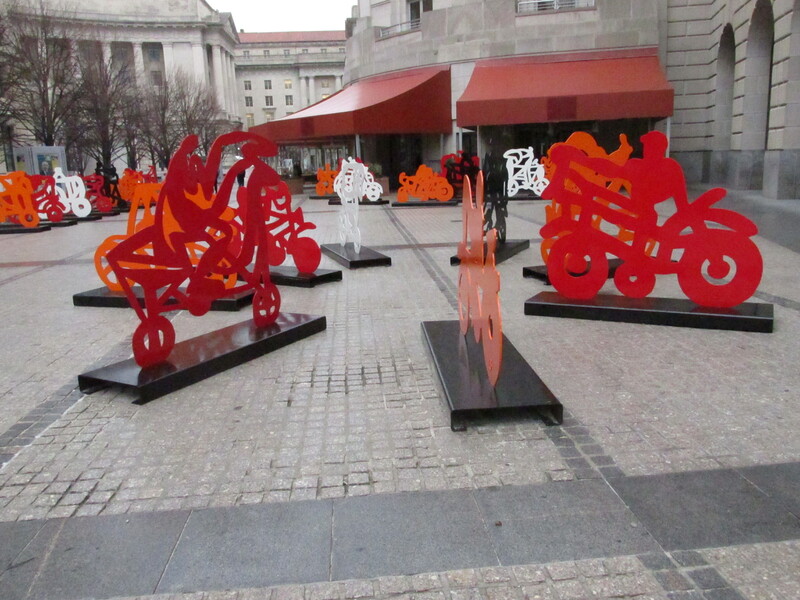 Las Bicicletas — Bicycle Inspired Sculpture in Washington Until April 5th | Park View, D.C.
Last week while on the way to the Wilson Building, I had the opportunity to see the traveling sculpture exhibit Las Bicicletas by Mexican artist Gilberto Aceves Navarro. 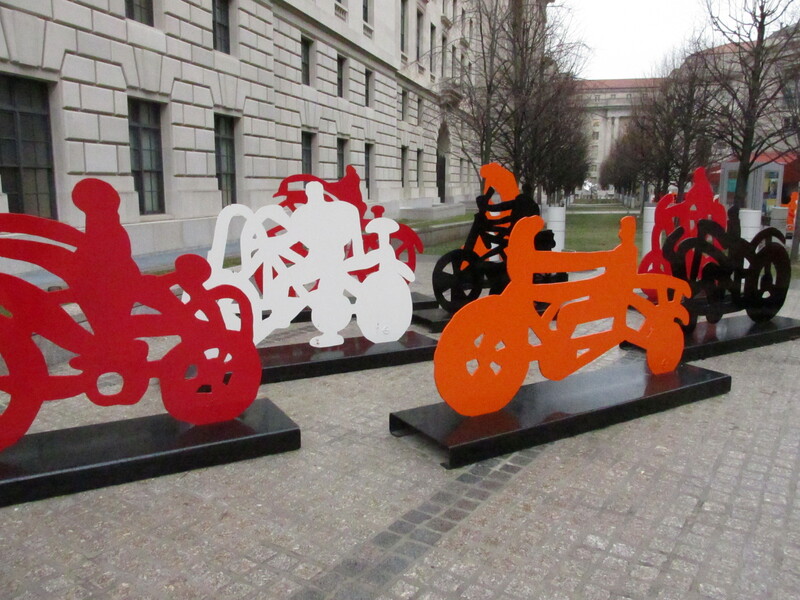 The installation is at the Moynihan Plaza by the Reagan Building until April 5th, meaning that you have until this Sunday if you want to see it in person. LAS BICICLETAS is an urban art exhibit created by Mexican artist Gilberto Aceves Navarro. It comprises 250 bicycle sculptures in black, white, red and orange; colors that were used by the Mayan culture to symbolize the four cardinal points. Our mission is to promote through art the use of bicycles as an alternative mode of transportation, to develop better living conditions for all people in friendlier cities. Our objective is that bicycles are universally recognized as vehicles of happiness and health. In 2014 LAS BICICLETAS started an international tour in the streets of New York City. In 2015, the tour will continue in Washington, D.C. where the exhibit will be displayed at the Moynihan Plaza of the Ronald Reagan Building and International Trade Center. As a tribute to celebrate Gilberto Aceves Navarro’s 83rd birthday, 83 sculptures will be exhibited for the public to enjoy during the month of March, 2015. This exhibit intends to offer, both visitors and residents of the city, a space for inspiration and the enjoyment of public art, as well at to render homage to the bicycle. In addition to the exhibit, LAS BICICLETAS is an art collection composed by 250 original designs, each piece on three different scales. Each of these sculptures has its respective certificate of authenticity properly signed by the artist. Gilberto Aceves Navarro (born in México City, 1931) is one of the most celebrated representatives of abstract expressionism in Mexico. He assisted David Alfaro Siqueiros as a young artist and today his name is synonymous of the best Mexican contemporary art. The most recognized awards and acknowledgements that the artist has received are The National University Prize (National Autonomous University of Mexico) in 1989, The National Prize for Arts and Sciences in 2003 and The Gold Medal for Merit in Fine Arts and Sciences in 2011. He has been invited on numerous occasions to show his art in Germany, Japan, Colombia and the United States. This entry was posted on March 30, 2015 at 7:01 am and is filed under Art, Public sculpture. You can subscribe via RSS 2.0 feed to this post's comments.